And in a blink, January was gone! Despite how fast time is flying, I was able to finish up a nice stack of books. Some were a bit disappointing but I found a few new favorites. Satisfying, indeed. So let’s get to it! Blended by Sharon Draper – This is a middle grade fiction novel that shares the struggles of eleven year old Isabella. Isabella’s parents are divorced. Since both parents live in the same town, Isabella spends alternate weeks with her mom and dad. Each “transfer” deepens Isabella’s question of where does she really belong? Where is home? How does she fit in these two very different households? That struggle in itself is challenging enough for a young girl but Isabella is also faced with who she is on a racial level. With a father who is black and a mother who is white, where does Isabella fit? Who is she? Events occur at school and home that make this question cut even deeper. Overall, this was a good read. I think the topics were handled appropriately for the target audience; definitely middle grade fiction. Marie Antoinette by Bernadine Kelly – This is a World Landmark Book and a surprisingly interesting biography. This served as a read aloud during our group studies and worked well with my teens down to my seven year old. We were able to learn about Marie’s childhood and bringing all the way to the tragic end of her life. This biography was full of information and details but managed to be engaging and entertaining as well. It definitely encourages a sympathetic view of Marie Antoinette. Considering the future her mother had planned for her, it was heartbreaking how ill-prepared Marie was for that life. During our reading we had much conversation and discussion on how the outcome could have been different and how much other’s decision directed Maria’s path. I highly recommend this Landmark Biography! The Care and Feeding of a Pet Black Hole by Michelle Cuevas. This book was grabbed off the shelf totally based on the author. We read and loved Confessions of an Imaginary Friend: A Memoir by Jacques Papier. It was such a beautiful, sweet book that took us all by surprise. How could I resist a book about a pet black hole!??!?!? Oh my, this book was funny, heartbreaking, and such a great read. I laughed out loud over Chapter 11. The Care and Feeding of a Pet Black Hole is the story of Stella coming to terms with the death of her father. It is set during the 70s so kiddos who enjoy space might enjoy the tidbit of history and space thrown into this book. I had to look up one or two things myself. And! I am totally prepared if a black hole wanders into my yard. I know exactly what it needs to be happy and how to give it a hug without falling in. This is a must read! Sweep: The Story of a Girl and Her Monster (Jonathon Auxier) – Mr. Auxier is a favorite author in our home. When I heard he had a new children’s novel out, I requested Sweep from our library immediately. We were not disappointed! Sweep takes up to Victorian London into the world of children and chimney sweeps. Life is harsh, dirty, and unforgiving. Young Nan has faced it all and keeps pushing forward. Then she faces sure death and is saved. Saved by Charlie…a monster. Or is he? And just what exactly do you do with a monster when you are suppose to be dead? This is a beautiful, bittersweet story of friendship, faith, and hope. It gives us a glimpse into a harsh time in history. We learn to keep our brooms up! and to save ourselves by saving others. I read this aloud and my children loves Nan, Charlie, Toby and even Prospero. I’m still torn on Prospero. We highly recommend Sweep! If you haven’t read Auxier other books, I highly recommend Peter Nimble and His Fantastic Eyes, Sophie Quire and the Last Storyguard, and The Night Gardener. Twelfth Night by William Shakespeare. Twelfth Night is the story of tangled relationships, shipwrecks, and mistaken identities. It is absolutely hilarious and delightful. I can not recommend enough reading Shakespeare aloud in a group. It has to be one of my favorite Shakespeare plays so far. Definitely recommend! On Magnolia Lane by Densie Hunter. This is the newest release from Christian Fiction author Denise Hunter. This story of a pastor (Jack) falling in love with a parishioner (Daisy) sound interesting and intriguing. Then it fell a bit flat for me. I’m not sure if there were too many smaller plot lines going on or if the character development just wasn’t deep enough? In any case, this one did not live up to my expectations and I was disappointed. Beneath a Scarlet Sky by Mark Sullivan. As a huge fan of World War II books, non-fiction and fiction, I was eager to dive into Scarlet Sky. A story based on a real life of Pino Lella in Italy during the German Occupation. Although this story was based on true life and events, it was fictionalized due to lack of documentation and accuracy of conversations, etc. Sadly, not too far into the book and I was struggling to embrace Pino, Italy, and all that was happening. The writing was stilted and choppy. Sometimes it read as if Sullivan was writing a fiction novel and then it shifted to a more fact based paper or outline. Normally, at this point I would put a book aside and move on to a new selection. However, I really wanted to love this story so I kept pushing through. In hindsight I should have just shut the book and let it go. At times it bordered at times on unrealistic and some of the events and actions Pino took seemed unbelievable. If you have read Scarlet Sky, I would love to hear your thoughts? I really struggled with this! I’ll Be Your Blue Sky by Marisa de los Santos. Ah, this was such a great read, y’all. Before you read this book, you need to read Love Walked In and Belong to Me. Then grab I’ll Be Your Blue Sky. I am not going to give away any of the story line. Truly. I loved these characters so much. I loved their stories. I loved the picture it paints of family and friendship and dealing with the hard and ugly parts of life. I highly recommend. Find a cozy spot, a yummy snack, and settle in! Now. Go! A Gentleman in Moscow by Amor Towles. This book. I read it on a whim. I had seen it mentioned online a few times and so I thought, “why not?” I am fairly confident that this book will by in my Top Ten for the year. I absolutely loved this book. Towles created a beautiful story set with the backdrop of Russian history. A gentleman who instead of facing death after the Revolution in Russia is exiled to a hotel. He must live out his life in a small servant room and never to leave the walls of the hotel. Decades pass by as The Count creates a community inside this hotel as he watches the changes of his beloved Russia. If you read only one book from this post, make it A Gentleman in Moscow. This is one I would love to own and would re-read. Highly recommend. I think that covers my January reading. You may have noticed that I didn’t mention anything about my Back to the Classic challenge. Ahem. It is moving at a bit of a slow pace. I will update where I am at on that in my next post. **This post contains affiliate links. These links in no way change your shopping/browsing experience. I may earn a small percentage if a purchase is made via my links. That’s its. Thanks for stopping by! Most of my personal reading is unplanned and driven by my mood. Over the last several years my reading tastes and preferences have expanded and grown for which I am thankful. Naturally a great deal of my reading time is spent with selections from the Children’s and Young Adult areas. What I have found surprising is that I am constantly reading books that share about people and events during World War II. It is most definitely unplanned yet I find myself captured by these stories. 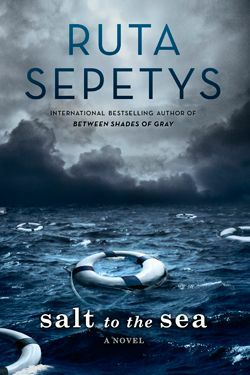 During a recent library visit, Salt to the Sea by Ruta Sepetys caught my eye. Between Shades of Gray by this same author had been on my to read list but I had to return it before I reached it in my pile. I grabbed Salt to the Sea and determined that I would bump it to the top of my stack. With Salt to the Sea, we journey with four young people to one of the greatest maritime tragedies but a tragedy that is not known by most. Four refugees, all carrying heavy, heartbreaking secrets and burdens, are all traveling to gain passage on the Wilhelm Gustloff. At one time the Wilhelm has been a luxury ship but now it would serve as the means of safety and hope for thousands..
Florian, Joana, Emilia, and Alfred. Four young people who will capture your interest and some your heart. Each person is telling their story; the book switching from character to character. This not only allows you to see the character from their own perspective, but also gain the insight of how they are viewed by those around them. It allows for great depth in the characters. The secrets and the burdens they are carrying are slowly peeled back layer by layer. This can be quite gut wrenching for the reader. So quickly I came to love some of these characters. Salt to the Sea is set during a tragic, horrific time in our history. So much pain, death, suffering, loss. As you read the stories of these four young people, there will be pain, sadness, despair, and loss. But there is also beautiful hope. Clearly you see forgiveness, strength, determination, friendship, sacrifice, and love. This time period seems to highlight man’s evilness and depravity. However, it is countered with such love and goodness. Salt to the Sea reminded me much of my reading experience with All the Light We Cannot See and Code Name: Verity. Powerful, powerful stories that reveal so much about us as people and our capabilities of hate and love. And in the end…hope. Always hope. I quickly passed this along to my 17 and 15 year old daughters. I will wait a bit before allowing my twelve year old to read it. I do highly recommend this for mature teens and adults. I’d love to hear your thoughts if you have read Salt to the Sea!